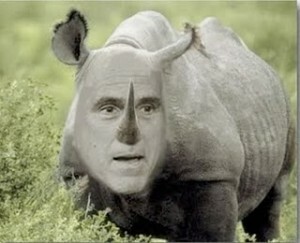 Mitt Romney: Portrait of a RINO — 1389 Blog - Counterjihad! If you think you’ve already heard everything there is to know about Mitt Romney, think again. A 200-page document that appears to be Sen. John McCain’s entire 2008 election-year opposition research file on the former Massachusetts governor hit the Internet with a vengeance Tuesday evening. And it’s an eye-opener. 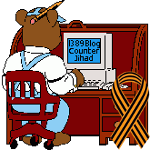 We have hosted a copy of this file on 1389 Blog. Click the above link to view or download. While the GOP establishment has been busy denouncing Newt as promoting “class warfare” by his attacks on Mitt and Bain, they’ve missed the bigger picture issue that rank and file GOP voters have responded to: Mitt Romney’s experience doesn’t make him the anti-Obama. Rather, Mitt’s Wall Street past, combined with his record as governor of Massachusetts, represent the alliance between government and business that has led to runaway spending no matter which side has been in power. Sure, Washington is to blame for most of the mess, but Wall Street has been complicit too. Behind every Solyndra loan was a commercial bank- in Solyndra’s case the Federal Financing Bank- that benefited from the risk free- for them- loans. Behind the financing of every budget deficit are more fees for Wall Street. Fannie Mae and Freddie Mac? They operated as a giant Ways and Means committee for Wall Street to off-load America’s housing risk on to the government. To be sure, Wall Street was just maximizing profits, as it’s supposed to. But is Romney the guy who’s going to shut down the Combine between business and government? While Romney would hope to position himself as a defender of free market competition, he is potentially vulnerable on the topic because only 35 percent of Americans believe that capitalism and a free market economy are the same thing. Candidate Romney, like many Republicans, tends to use the terms interchangeably. That’s dangerous when 39 percent of voters nationwide believe the country has a system of crony capitalism, while only 34 percent believe free market capitalism is practiced. The rest aren’t sure. Interestingly, this is one issue with very little partisan divide. Republican, Democrats and unaffiliated voters hold similarly skeptical views. Seven out of 10 Americans believe that big government and big business work together against the rest of us. Voters don’t mind businesses getting big; they just mind when the government gives them an unfair advantage over others. Like what happened in Romneycare. When Romneycare was crafted there were people sitting around a table talking about healthcare, but they weren’t talking about cancer, or broken bones. They were talking about money. You got it and they want more of it, risk free in the same way they off-loaded risk in the housing sector. While other parts of the economy are struggling, the healthcare sector is approaching all-time highs as represented by the S&P healthcare Select Sector fund. 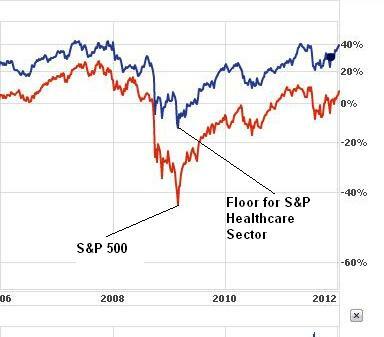 Romneycare and Obamacare, as seen in the chart below, have created an artificial floor for healthcare investments, protecting investors in a way that investors in the S&P 500, for example, don’t enjoy. The sooner we separate Washington from Wall Street, the better. And Romney is the only GOP candidate who forfeits the moral high ground in that argument to Obama. Any other GOP candidate will be able to credibly chastise Obama for the crony capitalism practiced by the left. But not Romney. GOP voters, thankfully, haven’t been gulled into believing that every investor automatically qualifies as a free market capitalist- see Buffett, Warren and Soros, George. Voters are rightly saying that they are not sure that being a venture capitalist qualifies one, per se, to be president anymore than being a community organizer does; especially when one factors in Mitt’s historic socialization of healthcare in Massachusetts. For GOP voters you can’t find a bigger attack on free markets or a stronger case of crony capitalism and government than that which Romneycare represents. As I just finished pointing out, the term “crony capitalism” is nothing more than a euphemism for government pork-barrel corruption. It is not about “capitalism” at all; it’s about buying votes, endorsements, campaign contributions, and other advantages through government spending and regulations that favor well-connected individuals and firms over everyone else. Whether it’s legal or not, it’s bad for America and it’s wrong, and Tea Party conservatives want no part of it.